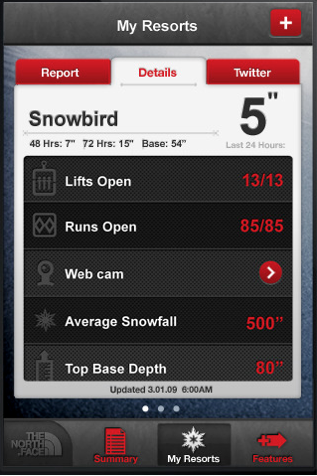 The Snow Report is a Communication Arts award-winning (Information Design) app, and is the #1 source for snow and winter sports conditions information in the mobile space. Using a custom built data- aggregation backend, we are able to pull together many different data sources for weather, snow conditions, avalanche warnings, social sharing and live cameras - then provide all this information through a single service with a variety of API endpoints. 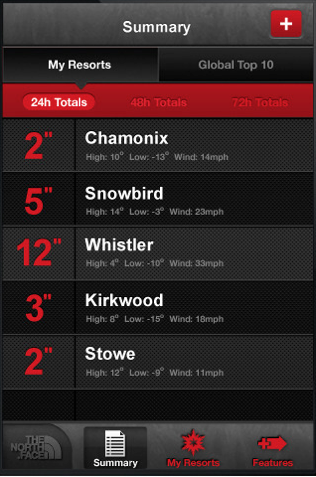 The Snow Report was a great success for the client. Because of our innovation in IA, Apple selected The Snow Report to be featured in Apple stores, print and TV spots in the US, as well as Europe and Russia. Since the RESTful backend service was completely decoupled from the app itself, we were also able to use the data service to power a web version, a Blackberry version, and use the data to trigger hyper-local banner ads on the web if snow was predicted in the area.